These Citrus Monkey Bread Muffins are the perfect way to celebrate Easter brunch. Transform Rhodes dinner rolls into the most epic citrus packed breakfast that your family will love. This post is sponsored by Rhodes Bake-N-Serv. All thoughts and opinions are my own. For more information, please read my disclosure policy here. You guyyyys. 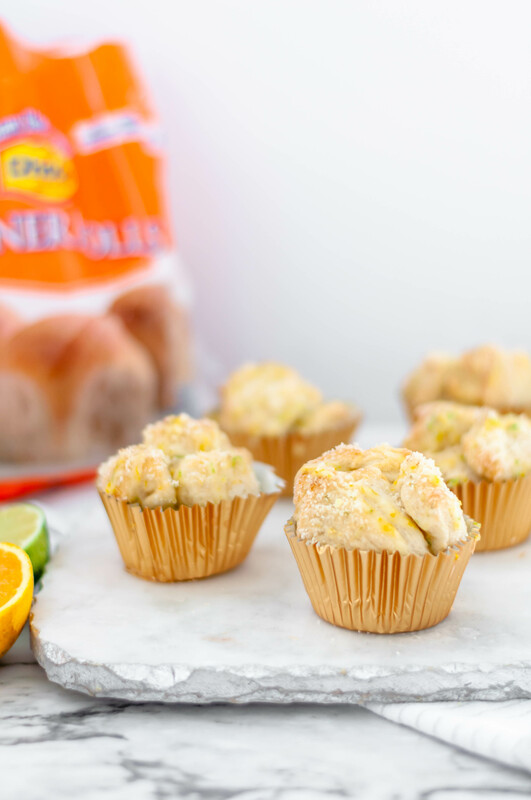 This may be my favorite recipe of 2019 and I can’t wait to tell you all about these Citrus Monkey Bread Muffins. First of all, they start with thawed Rhodes dinner rolls. I cannot tell you how often I turn to Rhodes rolls and bread dough to create easy dinners, fun desserts and delicious dishes. Rhodes is totally on brand for me. Easy to find and so simple to transform into something new and different. Basically my favorite kind of ingredient. So let’s dive into how to make these Citrus Monkey Bread Muffins. First you need allow 12 rolls to thaw and rise. You can follow the thawing directions on the bag of rolls or here on their website. Make sure to keep the rise time in mind when you plan on making these. I especially love the overnight method for this recipe because they’ll be ready when you wake up in the morning and it’ll just take minutes to get them in the oven. While waiting for the rolls to rise, mix up the citrusy sugar situation that will coat the bread pieces. You’re going to zest an orange, a lemon and a lime and mix that all together into citrusy goodness. We’re going to add half of the citrus zest mixture to some granulated sugar. It’s best if you do this by hand. As your mixing the zest into the sugar, squeeze and roll it between your fingers to mix it together. The squeezing releases the oils in the zest which carry SO much flavor. Once the rolls have risen, dice them into fourths and toss them in that citrus sugar. Then place dough pieces go into each muffin tin. If you have any extra citrus sugar, sprinkle it evenly among the monkey bread muffins before baking them. Some of the sugar that’s on the bottom of the muffins will caramelize as it bakes adding an extra little crunch and a rich, caramel taste. Perfectly pillowy bread pieces and the sweet crunch of the granulated sugar. Then all that citrus zest. Dying. And if you can believe it, things get even better from here. 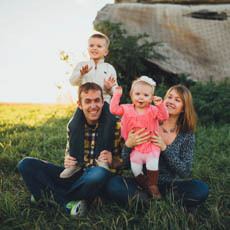 Remember that other half of the zest that we set aside? You are going to make a super simple powdered sugar glaze and mix in that remaining zest to drizzle over the warm monkey bread muffins. Yep. I did it. And you should too. These are so light and zingy compared to our traditional monkey bread recipe that also uses Rhodes dinner rolls. And I have to admit (no offense to the in-laws) but I love this version so much more. When I have the chance to choose between a lemon/citrus treat and something richer like chocolate, caramel or butterscotch I will ALWAYS go with citrus. If the rise time for the rolls isn’t counted, this recipe literally takes minutes to put together and it couldn’t get easier. When the hardest part of a recipe is zesting a few citrus fruits, I think we’re on the right track. These citrus monkey bread muffins are perfect for Easter morning breakfast or brunch. The citrus flavor is so light and bright and happy. They’ll be a definite NEED all throughout spring and summer. This post is sponsored by Rhodes Bake-N-Serv. All thoughts and opinions are 100% my own. Grab a bag of Rhodes dinner rolls and transform them into these incredibly yummy Citrus Monkey Bread Muffins. Super simple to make and packed with flavor. Preheat oven to 350 degrees F. Line a 12-cup muffin tin with liners. Set aside. Zest the lemon, orange and lime into a small bowl and combine well. Set aside. Do not discard the fruit, you'll need them later. Add the granulated sugar to a large bowl. Mix in half of the citrus zest, using your hands to really combine it into the sugar. Cut each roll into fourths. Add the pieces, a few at a time, to the citrus sugar and roll around until coated. Place 4 pieces into each muffin tin. Bake for 18-20 minutes, until slightly golden. While the muffins are baking, mix the glaze. Juice half of the lemon, half of the orange and half of the lime into a small bowl. Add powdered sugar to another bowl. Add 1 1/2 tablespoons of the citrus juice to the powdered sugar and whisk until smooth. Whisk in remaining citrus zest. If the glaze is too thick, add more citrus juice (very little at a time) until the desired consistency has been reached. Once the muffins come out of the oven, remove them from the tin and drizzle with the glaze. I put the glaze in a ziplock bag and snip a bit of the corner off the bag then drizzle over the muffins.